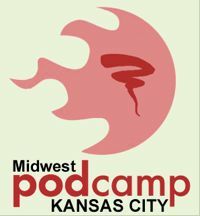 Just a quick reminder to our midwestern friends that PodCamp Midwest is tomorrow, Saturday, February 16, from 9am – 5 pm at the University of Kansas Edwards Campus, 12600 Quivira Road, in Overland Park. Elisabeth from Podcasting News is planning to attend. If you are coming to PodCamp, please track her down and say hello. PodCamp is a participant-led, user-generated unconference, in which the attendees set the agenda and lead the sessions. Since the first PodCamp (in Boston in 2006), dozens of PodCamps have been held all over the world, with attendance ranging from a few dozen to hundreds of participants. Topics range from Podcasting 101 to advanced topics of monetization and listener interaction. This PodCamp promises a special focus on podcasting in education, in addition to a wide range of general-interest podcasting sessions. That’s AWESOME! The women’s sessions never did get covered.